The very first thing the game tells you to do is turn your controller sideways and shake it as if it were a spray paint can. I’m not sure why it does this because the next thing it tells you is that you need to use the motion controls to spray paint (or “stencil art”, as they spin it). This screwed up the calibration completely and my cursor was in the wrong place the entire time as I struggled to paint within the lines. Thankfully, once you figure out how to do this the rest of the controls are perfect. But it certainly was a weird way to open a game. They were trying to introduce you to the game’s renegade protagonist Delsin Rowe, but I don’t see why it had to be interactive. There are quite a number of these “stencil art” minigames sprinkled throughout anyway. 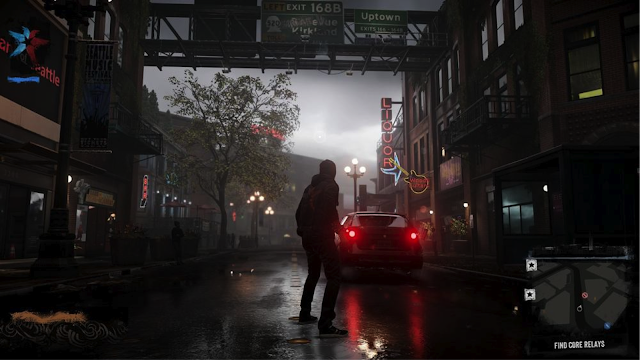 Regardless, after you get through some introductory story and tutorial stuff, the game spits you out into a recreation of Seattle. I’ve been to Seattle before, and I didn’t recognize anything save for the space needle. My point is that I don’t really see what the point of setting it in a real-world city was. The last two games (which I have never played, just so you know) were set in fictionalized versions of New York and New Orleans. The benefit is that you can be more imaginative if you’re taking liberties. The map is split into two halves separated by a bridge and the first half is beautiful but generic. In the second half things start to get kind of crazy as the city is slowly transformed into an evil fortress of oppression. But even then the game adheres to the basic look and layout of the city of Seattle. It is fun to traverse even though it lacks some video game personality. It’s the reason you see so many open world games in fictional places. The developers can get creative and weird with it. But Seattle is merely the stage for all of the players. And the players are pretty awesome. No matter how cool the city is, the game could still be bad if it isn’t fun. Luckily that’s not a problem that Second Son has. 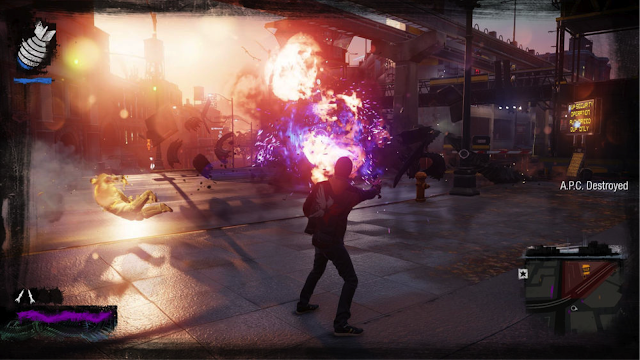 I have been told that Second Son doesn’t particularly play like previous inFamous games. In fact, it’s only very loosely connected. 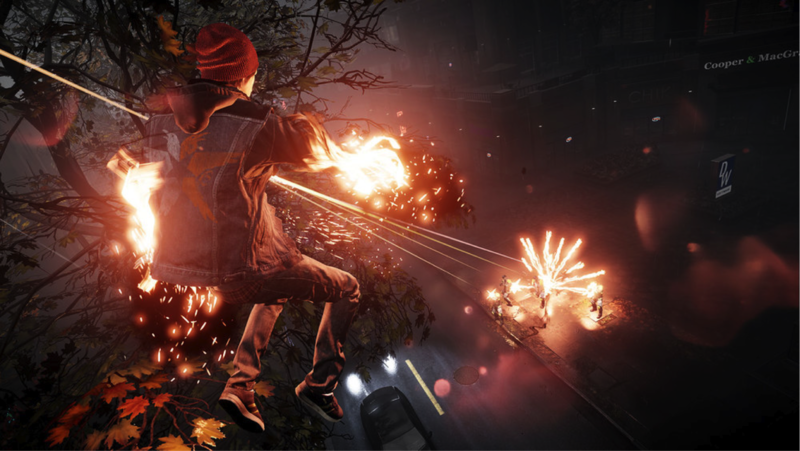 It seems almost as if Sucker Punch is distancing this game from the others by slapping “inFamous” in very small letters compared to “Second Son”. I’m totally cool with this. In fact, I’d love to see it spun off into its own franchise or series like the Ezio Assassin’s Creed games. The game is extremely fast-paced with a focus on run ‘n gun. It’s essentially the most exciting third person shooter I’ve ever played. It’s like the if a third person shooter was an action game. Almost all of Delisn’s attacks focus on speed and range, with only one basic combo for a melee attack. It’s the type of thing you’ll really only use when you’re in a tight spot. Otherwise, you’re running all around shooting dudes with hand blasts or sniping from rooftops, occasionally launching devastating blasts that can destroy certain structures. Oddly enough, the game reminded me of the Xbox-exclusive Crackdown in the way you can traverse the city, shoot at dudes, and hunt down glowy bits to power up. This is a big compliment in my book because Crackdown was awesome. It’s kinda-sorta-not-really the sequel to that game I’ve always wanted. Let’s start with the powers. In the world of inFamous there are people known as “conduits” who are either born with superpowers (prime) or are given them through genetic tinkering. It all reminded me a lot of X-Men which is actually my favorite “dudes with powers” group. Delsin just so happens to have the best power of all which is to steal other people’s powers and have them forever because, apparently, once he copies a power then he just adds it to his arsenal instead of losing the last one. Would this really make sense? Probably not. But considering superpowers don’t exist anyway then I guess anything is possible. For the sake of this game, it’s the best power to have! The powers in this game are all very nontraditional. The guys you fight have concrete power and the other conduits you meet have smoke, neon, and video powers. There’s even a guy in some bonus missions that has paper as a power. Basically, nothing is too weird or out of bounds as far as powers go. You start with smoke. I had smoke for quite a while and had a blast taking out enemy stations and hunting down shards to upgrade my powers. In fact, I would have been cool with it if that was the only power in the game. And it sounds lame, right?Wrong! You shoot flaming embers, turn into a smoke cloud to pass through fences and vents, send enemies into coughing fits for easy takedowns and turn into a volcanic ash bomb. Neon lets you run up buildings, slow time to target enemies weak points, and trap foes in neon orbs. Video gives you a rapidfire pixel machine gun, digital wings to soar and hover, giant swords, angles, and decoys made of holograms. The concrete guys? They’re your main threat and attack by manipulating the concrete around them to vault into the air, form shields, and hurl chunks of concrete at you. Actually, it’s almost exactly like earthbending in Avatar. I also enjoyed that your powers drain over time and you need to constantly be aware of the power sources in your surroundings. It forces you to get creative and try out each of the powers rather than just sticking with one the whole time. All these powers are from people you encounter in the game and they’re all quite well developed, written, and acted. Troy Baker as protagonist Delsin proves once again that he’s the best in the business. Last year, he voiced Booker in BioShock, Joel in The Last of Us, and The Joker in Arkham Origins. He’s back again with a completely different sound to his voice. This in contrast with Nolan “everyman” North who always uses his regular speaking voice. The rest of the cast is equally well performed, with the main villain, Augustine, being someone I really loved to hate. Unfortunately, most of the supporting cast doesn’t get the development I was hoping for. After Delsin meets his fellow conduits, there’s usually a flash-forward to where the character has obviously developed some sort of deeper relationship with Delsin. It’s really too bad we don’t get to see how this plays out. This sort of feeds into my next point which is the morality system. It works pretty well for combat, but that’s about it. It’s only skin deep and that holds the game back, especially when it comes to the narrative. You’re given a few choices throughout the game that are either obviously good or obviously evil, which steers the story in a good or evil direction. After your choice, you’re given two missions, one good and one evil, but you are completely locked into the one that doesn't match the choice you just made. I find it weird that the game even gives you the option to go all the way to the opposite mission just to have it tell you that you made the other choice and can’t do this one. I went all good in my playthrough so I have no idea what happens if you switch between good and bad as you go along. But I do know that it doesn’t benefit you at all to switch between good and bad actions during combat. As you do good or bad actions, you’ll level up your karma. With each level, you’ll unlock new abilities you can invest in which are karma-centric. So good abilities are focused on incapacitating enemies and bad abilities are about killing them. But accidentally kill somebody and you’ll lose good karma. One major gripe is that the melee and execute button are the same, so I’d accidentally end up killing dudes and lose my karma streak which builds up with (in my case) takedowns and allows you to use your ultimate ability. I was okay with being locked into one style of play, but I don’t see why I couldn’t at least be given the option to access the evil powers. I guess it’s tied into the fact that everything is completely black and white and sometimes being good or sometimes being evil wouldn’t make you all that powerful. This also means that you can only either choose to do good or bad things to the characters around you when you’re asked to make a choice, and you never really see the progression of that choice. Take Fetch, for example. She’s out to get revenge on the drug dealers she blames for the death of her brother, and so she hunts them down and kills them. I chose to redeem her, which triggered a cutscene where Delsin convinces his cop brother to let her go and says something like “We need to talk” to Fetch. Then, flash forward an unknown amount of time and the two are friends and Fetch has given up her evil ways. What happened in between there? I wish we got to see that conversation. Despite being an open world game, the progression is pretty linear. The world is beautiful, but there’s not much to do in it. The game has a number of side objectives in each district, but they’re always the same: track down a spy, do “street art”, find a hidden camera, or track down audio logs. There’s also drones to hunt down and destroy for shards used to upgrade your powers and various good or evil acts like busting up drug deals or protest rallies, killing or saving prisoners, and destroying surveillance cameras. All of these contribute to you freeing the city from DUP occupation. The real centerpieces of the game involve invading and destroying the mobile command centers scattered throughout the city. These battles were very exciting and left me highly outnumbered in a good way. Taking down overwhelming forces with your superpowers is where this game thrives. Once you get a district below 30% occupation, you can challenge the DUP to a showdown which may consist of an army of guys, a squad of attack helicopters, or even a few immensely powerful armored dudes. These are also pretty fun, but tend to be a lot shorter and easier than the mobile command raids. The game also has a few bosses that are very unevenly paced and probably the least-fun part of the game. Not that they’re broken, but the game is designed in a way that compliments combat against a bunch of guys instead of just one. Character progression is satisfying and frequent, although I ended up spending more time with smoke than anything because I decided to tackle a lot of side missions early on. That said, it’s maybe a bit too easy to progress. By the end I collected every shard and unlocked every power, plus I reached the top karma level pretty early on because the game makes it really easy to collect karma both in and out of combat. Infamous: Second Son is the only game in my entire life that I’ve ever completed 100% because it was really easy to do so. Having said that, Sucker Punch provided a free update to the game shortly after release that added post-game content including new raids so you can make use of that secret fourth power, the ability to change the time of day at will, and a photo mode that lets you take some really incredible shots such as the big header up top. Additionally, there are free DLC chapters called “Paper Trail” which blend in-game objectives with online puzzles. It’s an interesting and unique idea that I appreciate (especially for the low, low price of free) but I personally found the need to switch between game and computer to be annoying. Can’t fault them for free content, though. 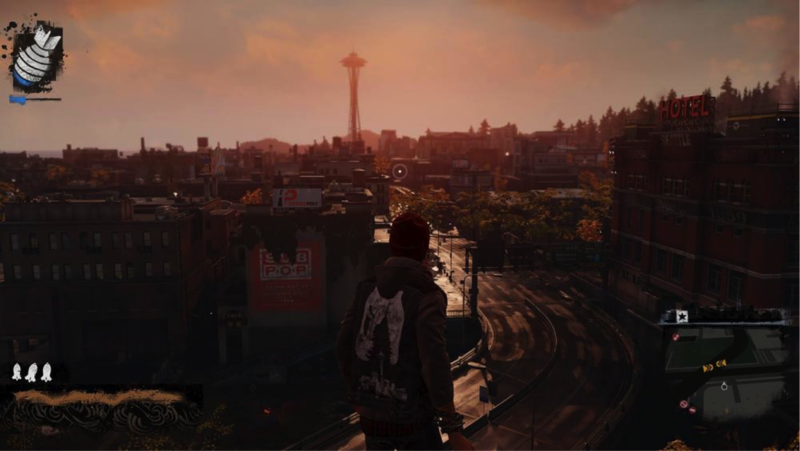 Despite my quibbles about a few things, it doesn't stop Second Son from being an immensely fun and incredibly kickass game with a fantastically appropriate Seattle-rock soundtrack. I enjoyed the more personal take on the superhero story that made it feel less like I was saving the world and more like I was dishing out justice and being a badass doing it. It’s not perfect, but it’s a must-have for PS4 owners. I’m not sure it’s a system-seller, and it doesn’t leverage the system’s power in new and fantastic ways, but it’s definitely the game early adopters have been waiting for. As much as I enjoyed the characters and narrative, at the end of the day you’ve got a game that’s just pure fun. If Sucker Punch spun off Delsin’s story into its own series for a potential sequel, that game would be in my PS4 on day one.